Hosts of this year’s California State Track & Field Championships and the Mountain West Conference Championships, Clovis Unified School District is prepping for the upcoming meets with a major track surface overhaul at Buchanan High School – Veterans Memorial Stadium. District officials opted to resurface their existing aged Mondo surface with Beynon’s BSS 2000RE resurfacing system and exclusive Hobart texture. In addition to being the host track of the California State Track & Field Championship Meet since 2009 and the Mountain West Conference Championship since 2017, Veteran’s Memorial Stadium also hosted the 2016 USA Track and Field (USATF) Jr. National Championship and is home to Buchanan High School’s track team, a powerhouse track & field program in California, that has won a staggering 27 conference championships since 1993. It won’t take long for the new Beynon surface to be under the spotlight. 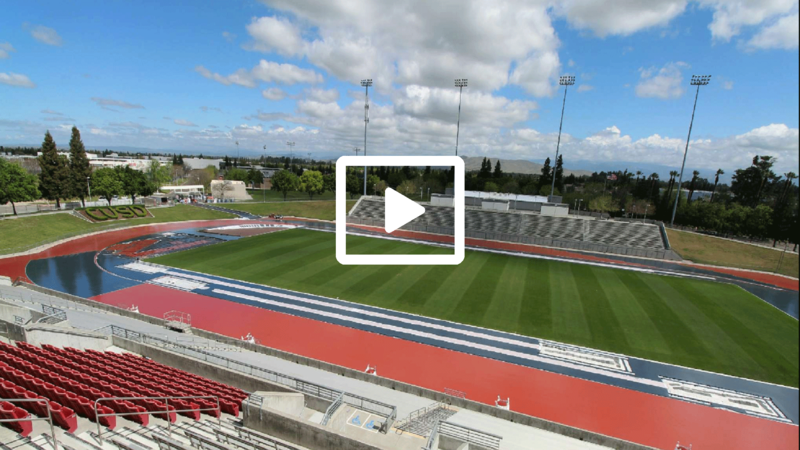 Weeks after completion, Veterans Memorial Stadium will host the Mountain West Conference Championships, presented May 8th to 11th, followed by the California State Track & Field Championships, May 24th and 25th. WHAT IS A RESURFACING SYSTEM? Eliminating the need for an expensive and complex removal process, Beynon’s resurfacing application restores the appearance, texture and performance of the existing surface by installing a new polyurethane based system over the aged track. The application helps simplify the construction plan, repurposes the existing track, and helps reduce costs. A true win, win, win for the District. Not only does it improve aesthetics, but it brings aged rubber sheet good products and two-component polyurethane systems back to within IAAF performance parameters. “It is a privilege and an honor for us at Beynon Sports to be chosen to resurface the track at Veterans Memorial Stadium, one of the premiere track venues on the west coast. We pride ourselves on delivering a surface that offers leading performance and optimal feel underfoot. We should see some exciting moments on the surface in the months to come!” John Beynon, Founder and President of Beynon Sports Surfaces. Trusted and installed at every level, Beynon Sports is showcased at the University of Oregon – Hayward Field, Stanford University, University of California, University of Southern California and will be the featured surface for the new MT SAC track & field facility. For the running surface, Clovis Unified School District officials selected Beynon’s revolutionary BSS 2000RE system with the proprietary Hobart texture. Regarded as the ultimate edge in performance, the Olympic-caliber system is IAAF certified, offers athletes maximum energy return and is backed by Beynon’s unmatched warranty and reputation for superior customer service. The project features a Beynon Red and Navy Blue design, with the stadium track being predominantly red, with navy blue exchange zones and non-competition areas. Learn more on Beynon HERE. Beynon Sports manufactures and installs high performance polyurethane synthetic running track surfaces designed for speed, competition and most importantly, daily training. As a vertically integrated company, Beynon Sports is able to offer leading track surfacing systems along with local installation and dedicated customer service. With regional offices in Fresno, CA, Georgetown, TX, Hunt Valley, MD and Tualatin, OR we bring a local approach to every project. Renowned for quality, Beynon is the trusted surface of leading track & field programs.